Past research indicates that access to health care and utilization of services varies by sociodemographic characteristics, but little is known about racial differences in health care utilization within racially integrated communities. To determine whether perceived discrimination was associated with delays in seeking medical care and adherence to medical care recommendations among African Americans and whites living in a socioeconomically homogenous and racially integrated community. A cross-sectional analysis from the Exploring Health Disparities in Integrated Communities Study. Study participants include 1,408 African-American (59.3%) and white (40.7%) adults (≥18 years) in Baltimore, Md. An interviewer-administered questionnaire was used to assess the associations of perceived discrimination with help-seeking behavior for and adherence to medical care. 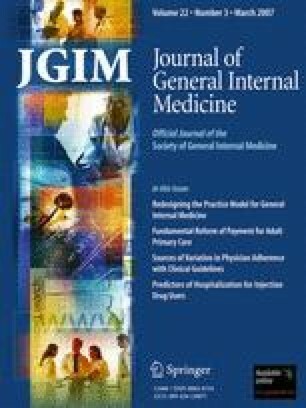 For both African Americans and whites, a report of 1–2 and >2 discrimination experiences in one’s lifetime were associated with more medical care delays and nonadherence compared to those with no experiences after adjustment for need, enabling, and predisposing factors (odds ratio [OR] = 1.8, 2.6; OR = 2.2, 3.3, respectively; all P < .05). Results were similar for perceived discrimination occurring in the past year. Experiences with discrimination were associated with delays in seeking medical care and poor adherence to medical care recommendations INDEPENDENT OF NEED, ENABLING, AND PREDISPOSING FACTORS, INCLUDING MEDICAL MISTRUST; however, a prospective study is needed. Further research in this area should include exploration of other potential mechanisms for the association between perceived discrimination and health service utilization. This research was supported by grant no. P60MD000214-01 from the National Center on Minority Health and Health Disparities (NCMHD) of the National Institutes of Health (NIH), and a grant from Pfizer, Inc. to Dr. LaVeist. Dr. Cooper is supported by a grant from the National Heart, Lung, and Blood Institute (K24HL083113). Princeton Survey Research Associates. 2001 Health Care Quality Survey. http://www.cmwf.org/surveys/surveys_show.htm?doc_id=228171. 2006.